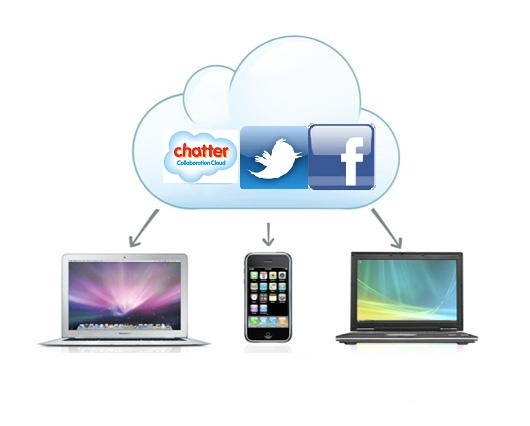 Cloud Computing is changing us more than we can think along with Social Networks. Most of the people today, has a smartphone connected to Internet for 24 hours. Which often means that we receive emails at any time of day and any day of the year even when normally we would not need, because the office is away from your desk, but not limited to the famous notifications now, anywhere smartphone or tablet, have changed our world upsetting habits and rhythms. It is obvious that, cloud computing or the technologies for the mobile devices are actually not directly responsible, just like dynamite was intended for not destroying the mankind; but the mobile device manufacturers are actually making us to think that we are so busy that we need 24 hours email notification. It is relevant to read our previous article Social, Mobile, Cloud Computing and Information Technology for more correlation. The notifications reach us within 24 hours including the warning of a new message on Facebook, a notification on WhatsApp or any other application that calls our attention in this way. But this has effects effects which is scary because we ferried in a society of distraction. What is happening in the B2B world, small and medium-sized businesses, as well as those who work online, it is intolerable to us any kind of interruption of service. Probably this aspect is less well known to those who work in the service sector for the network, but you might know that a few minutes of downtime can trigger hundreds of open tickets in a small average ISP that provides internet connection, mail services and webhosting – if they are down with and it often come as threats, legal aids are actually abused requesting for immediate action. We should not think about the prices of devices or the extra needed cost. Customers who pay more expect more attention and less downtime. It does not work like that, in reality there is no real distinction in customer expectations of lower and high-end, both of these branches are demanding that their service is always available and show a strong level of intolerance when there are disruptions. As mentioned this phenomenon is more visible, often with no reason, because the web site that is not available just for a moment is of no importance to the customer, but the fact that this triggers a sense of lack of intolerance, which leads the business owner to do all to solve this because you need to get back online as soon as possible. It is a major problem because it forces ISPs and service companies to enhance and even change the logic of their services, if it is clear to everyone that unfortunately the 100% uptime does not exist. Forget about the cumulative loss of productive hours to the students, the potential health hazard of microwave radiations. It is a known fact that, using a computing device or anything which demands a good attention and is addictive can harm the intrafamily relationships. A small polite request from the other room by mother or wife sounds poisonous. Mother possible can not be thrown legally but a spouse can be. An abnormal increase in rate of divorce in most developed countries and progressing towards developed nation like India, can be an direct result of this poison, add the flexibility of television serials. This Article Has Been Shared 4259 Times! Cite this article as: Abhishek Ghosh, "Cloud Computing and Social Network : You Can Not Stay Offline," in The Customize Windows, May 17, 2013, April 26, 2019, https://thecustomizewindows.com/2013/05/cloud-computing-and-social-network-you-can-not-stay-offline/.